Make a histogram of the DataFrame’s. A histogram is a representation of the distribution of data. This function calls matplotlib.pyplot.hist(), on each series in the DataFrame, resulting in one histogram per column. The pandas object holding the data. If passed, will be used to limit data to a subset of columns. If passed, then used to form histograms for separate groups. Whether to show axis grid lines. If specified changes the x-axis label size. Rotation of x axis labels. For example, a value of 90 displays the x labels rotated 90 degrees clockwise. If specified changes the y-axis label size. Rotation of y axis labels. For example, a value of 90 displays the y labels rotated 90 degrees clockwise. The axes to plot the histogram on. In case subplots=True, share x axis and set some x axis labels to invisible; defaults to True if ax is None otherwise False if an ax is passed in. Note that passing in both an ax and sharex=True will alter all x axis labels for all subplots in a figure. In case subplots=True, share y axis and set some y axis labels to invisible. The size in inches of the figure to create. Uses the value in matplotlib.rcParams by default. Tuple of (rows, columns) for the layout of the histograms. Number of histogram bins to be used. If an integer is given, bins + 1 bin edges are calculated and returned. If bins is a sequence, gives bin edges, including left edge of first bin and right edge of last bin. In this case, bins is returned unmodified. All other plotting keyword arguments to be passed to matplotlib.pyplot.hist(). 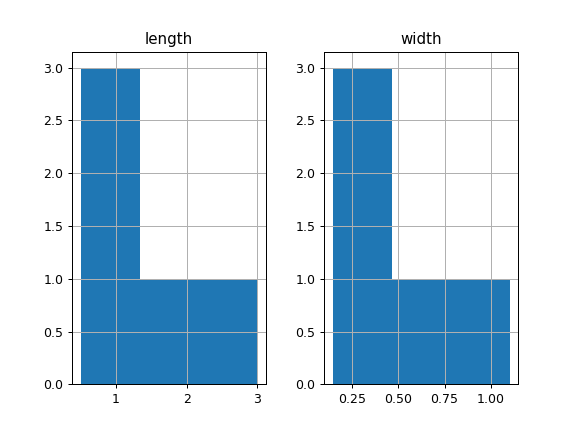 Plot a histogram using matplotlib.